Photograph reproduced from Fred Kaplan's Henry James :The Imagination of Genius (New York: William Morrow, 1992). See also the bibliography of primary and secondary sources at the Woolson Society page. 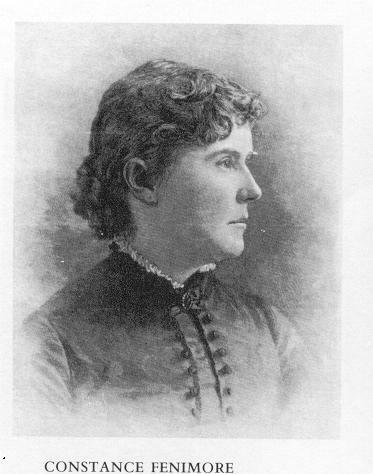 Catalogue of Letters of Constance Fenimore Woolson. This resource is made available through the generosity of Sharon L. Dean and Resources for American Literary Study (AMS Press). From Sharon L. Dean, "Constance Fenimore Woolson's Letters to Dr. William Wilberforce Baldwin," Resources for American Literary Studies, vol. 31 (2007): 126-155. Copyright 2007 AMS Press, Inc. All rights reserved. Constance Fenimore Woolson Society Page. New URL. This authoritative and comprehensive scholarly siteincludes a chronology of Woolson's life, bibliographies of primary and secondary works, calls for papers, pictures, teaching resources,and information about the CFWS. Cheryl Torsney's list of Woolson letters available in research collections. "Lily and Diamond (with illustration)"
"Crowder's Cove: A Story of the War"
"A Fire in the Forest"
"Two Women, 1862, Part I"
"Two Women, 1862, Part II"
"Up in the Blue Ridge"